As part of National Engineers Week, ASCE’s Metropolitan Section held an Engineers Week Kids Day. 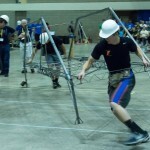 During National Engineers Week (EWeek), scheduled Feb. 23-28 this year, many ASCE Sections, Branches, student chapters and members observed the celebration with a series of events. Those included everything from organizing Popsicle Bridge Contests, hosting an Introduce a Girl to Engineering Day, organizing an Engineers Week Banquet, or having an Engineers Week Proclamation presented and read by their state’s governor. Since 1951, National Engineers Week has been an annual celebration saluting the incredible contributions engineers make to society and promoting engineering careers to the next generation. 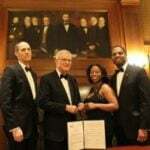 ASCE Executive Director Thomas W. Smith III, (left) and President Robert D. Stevens (center left), signed a Memorandum of Understanding with the National Society of Black Engineers at a ceremony held at the National Academy of Sciences on Feb. 24. To culminate EWeek, the National Building Museum and the National Engineers Week Foundation will hold their annual Discover Engineering Family Day on Saturday, Feb. 28. Sponsored in part by ASCE, this event encourages kids to explore engineering through more than 25 hands-on activities and demonstrations. The one-day event attracts as many as 10,000 participants and has become a hallmark of the national celebration. This year’s nominees for the DiscoverE New Faces of Engineering Professional and College Edition, including seven ASCE members, were also announced during an Engineers Week Web event on Feb. 19. 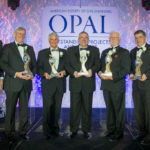 The highly coveted New Faces honor is recognized as a top achievement for young engineers by their peers in the engineering community. Courtney Davis, P. E., M.ASCE, is a project engineer with the Seattle, Washington, office of KPFF Consulting Engineers. President of the ASCE Seattle Younger Member Forum, Davis’ research has made a significant impact on the masonry design code. Maria Gibbs, S.M.ASCE, is a Ph.D. candidate at the University of Notre Dame and a recipient of a prestigious National Science Foundation Graduate Research Fellowship. Gibbs’ research has allowed the humanitarian organization Bridges to Prosperity to push the span limits of footbridge technology, increasing the reach of the organization’s efforts. Kenneth R. Mika, P.E., M.ASCE, is an environmental engineer with Natural Resource Technology, Inc. He has worked on several significant projects including as project manager and design engineer for an in situ solidification/stabilization (ISS) project in eastern Wisconsin. 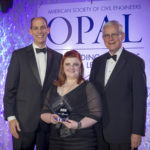 Alexandria Boddy, S.M.ASCE is a student attending Florida Institute of Technology (FIT) majoring in civil engineering with a minor in sustainability. Credentialed as a LEED Green Associate, Boddy has held two internships in the civil engineering field over the past three years. Katie Burns, S.M.ASCE, is a student attending the University of Toledo with a major in civil engineering and a minor in business administration. Her experience with Engineers Without Borders-USA has also afforded her the opportunity to gain a global perspective of the challenges facing engineers. Victor Murillo, S.M.ASCE, is a student attending Texas A&M University-Kingsville (TAMUK) majoring in civil engineering with a minor in mathematics. Murillo is a member of the team performing professional design services for the TAMUK/City of Kingsville partnership to renovate infrastructure in the historical downtown district. Jennifer Kearney, S.M.ASCE is a student at Penn State is majoring civil engineering. After hearing about Bridges to Prosperity (B2P), a nonprofit organization that builds pedestrian bridges in third world countries to provide isolated communities access to basic needs, she decided to not only start a B2P chapter at Penn State but also lead a 10-member team in Caimital, Panama. In early April, the DiscoverE Steering Committee will select two of these nominees (one professional and one student) as members of the 2015 class of New Faces of Engineering. We want to hear from you, what did your local ASCE Section or Branch do during EWeek?